This time I got a better $3 box from Al, after I expressed a bit of disappointment with the last one. If he keeps them like this one he'll have me buying for a while. 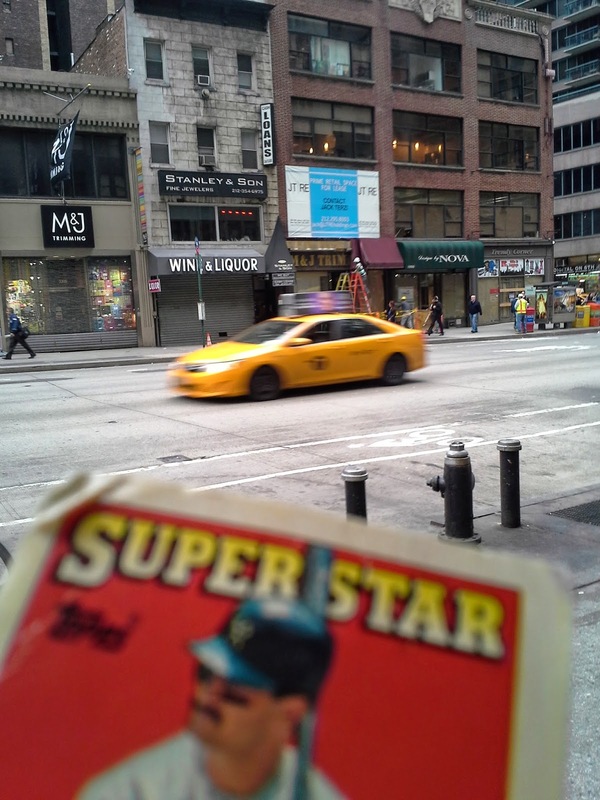 It was a 600-count box that was about a quarter basketball, a quarter football, a quarter junk was baseball, but still a quarter of it being baseball cards from the last twenty years. Here are some highlights of the good stuff. This is Kevin Ool. Notice there is no P in it. Please keep it that way. There were a lot of mid-00's Bowman cards, including a bunch of the weird chunky gold parallels. Good stuff. Some cool inserts. I've seen a lot of cards with map backgrounds but never one with a weather map. It actually looks really cool. The opposite end of the spectrum is this thing. I'd never seen a Topps 205 card before. It has very thin stock and an amateurishly-drawn picture. Almost looks like a fan's custom - in fact there are better fan-made cards out there. 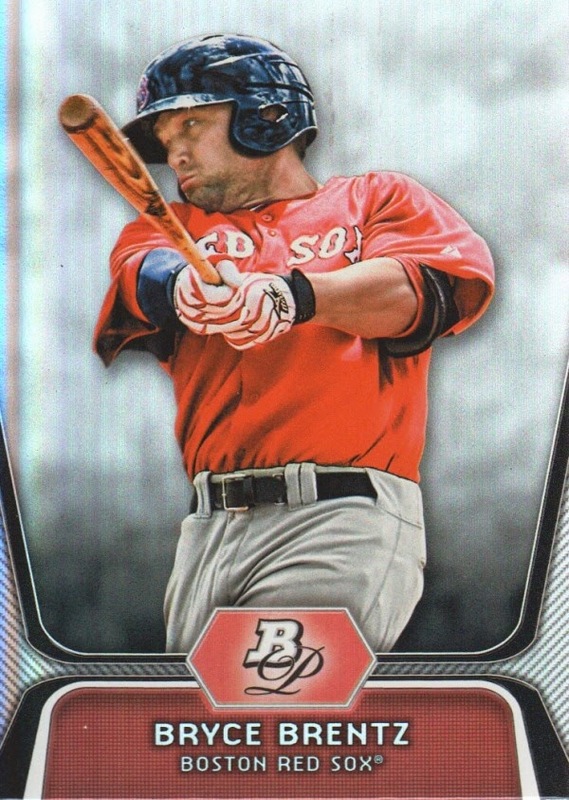 I have one card of Bryce Brentz, from 2012 Bowman Platinum Prospects. Playing career: Boston’s first round pick in 2010, outfielder Bryce Brentz made his big league debut in 2014, hitting .308 with 0 HR and 2 RBI in nine games. Where he is now: This year at AAA Pawtucket he is hitting .288 with 3 HR and 9 RBI in 17 games. Google Autocomplete results: He is fifth when you type Bryce b, between Bryce Brown Rotoworld, referring to the Buffalo Bills running back, and Bryce Barneys Hudl, referring to a high school football player in New Jersey. There do not appear to be any other prominent Bryce Brentzes. Coming up next: The next profile will be Craig Breslow. The street vendor on Broadway was back after being away for a few weeks. I picked up another $3 box but despite the low price it wasn't actually that great a buy. Out of a few hundred cards in the box there were only 23 baseball cards I needed. A few of them were from the 2007 Fleer set like this one. There were maybe a hundred cards that I didn't need that are up for trade if anyone wants them. Highlights include most of the rated rookies from 1988 Donruss, a bunch of '88 and '90 Topps Big, some '95 Topps, and some '94 Ultra. The box was probably 90% football. I'll keep most of them for someday when I really start a football collection. Lots to dupes to trade though - the cards pictured below give an idea of some of the most common sets to appear - 2007 Playoff, 2009 Stadium Club, 2006 Topps, 2007 Ultra and 2007 UD Artifacts. At least this time there was almost no basketball. There were a few hockey cards, all of which are available for trade. Most of them were from '91 OPC. As I have written before, I find it fun to check out what old signs might be hiding underneath new ones. Earlier this month, I caught an old sign that was revealed when a jewelry store went out of business. The awning was coming down, revealing a sign for a business called "M&J Trimming". Was this some long-defunct business, forgotten for decades? Nope, it had just moved at some point two stores down the block. Still, fun to find the old sign. It was visible for a few days but now that whole section of the building is covered up. 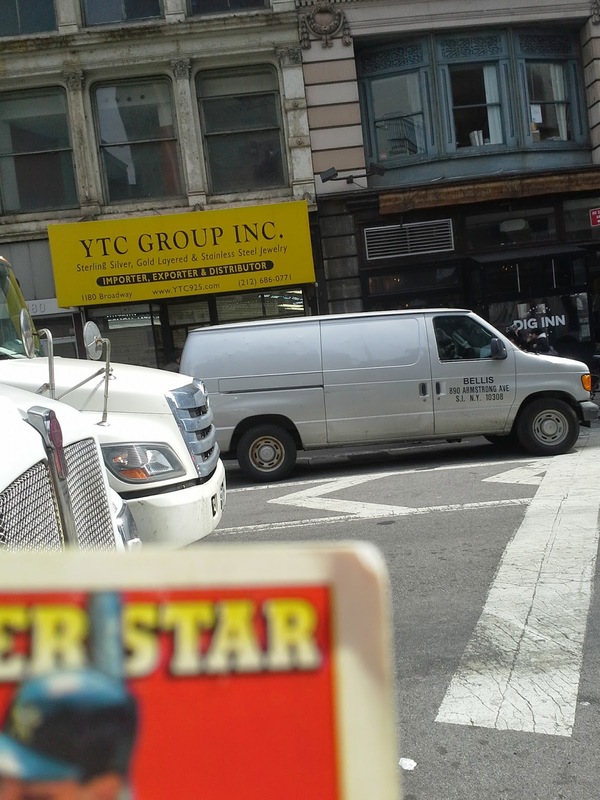 I have seven cards of Tom Brennan. This one is from 1984 Fleer. 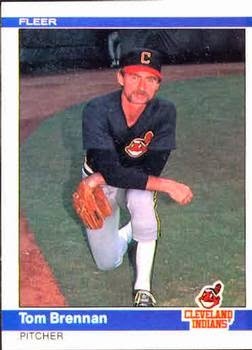 Playing career: Tom Brennan pitched for the Indians, White Sox and Dodgers from 1981 to 1985. In 64 games he went 9-10 with a 4.40 ERA. Where he is now: A youth baseball instructor in the Chicago area for many years, he played the home plate umpire in the 1993 movie “Rookie of the Year”, according to the Southtown Star. Google Autocomplete results: He is first when you type Tom Bre, ahead of Tom Brevoort, a comic book editor. There are no mentions of the baseball player on the first page of Google results; the first entry is for a college basketball announcer. Coming up next: The next profile will be Bryce Brentz. 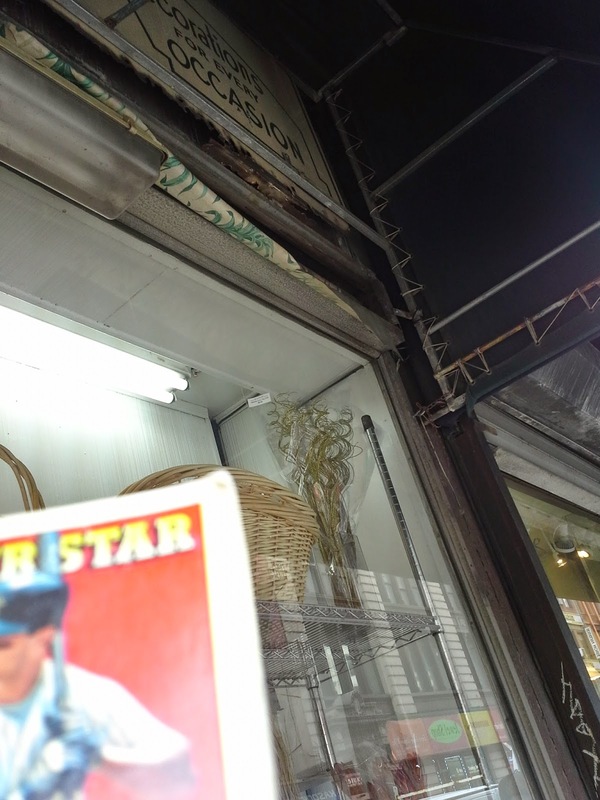 1995 Upper Deck with Bo Jackson - "Missed it by that much!" Even the back is great - Bo taking ground balls at second base! Later year Upper Deck cards had lots of great shots too. Here's a nice little twist on the traditional cameo shot. Topps never has quite as good photographs as UD did. This one is pretty good though. Adam from Infield Fly Rule and I recently had a massive trade and yesterday I got a box packed full of awesome stuff, a great random mix but mostly Topps cards from the last five years. Haven't gotten a chance to upload my wantlist but he really whittled down those 2010-2013 years. I haven't had a chance to really look through all of it yet but here are a few highlights that jumped out at me. Lots of awesome shiny cards, which I love. This Adam Dunn card was one of the shiniest. I had seen these cards which brought back the old Topps Rookies design from my youth, but this is my first time actually having one. I enjoy it more than a lot of the other retro designs, just wish it was super-glossy like the old ones, to give it a more realistic feel of being back in 1989. This was a funny card. I'm definitely not a Red Sox fan but Manny was one of the most fun players to come along in the last couple of decades, except when he was hitting home runs against the Yankees! The backs of the Bowman cards are always interesting. Sometimes they reveal more than they intend - doesn't sound like the Ethier brothers are terribly close. One thing the wallet card and I have really been interested in finding is old privilege signs - advertising signs with Coke or Pepsi logos that were common in the 1950's and 1960's but are rarely seen today. 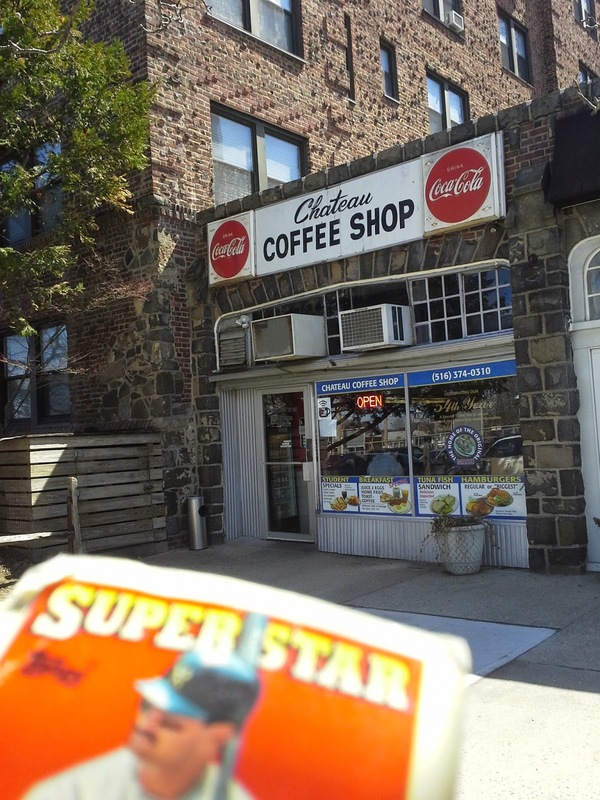 I have shown a few in the city but this is the first I have spotted on Long Island - this is the Chateau Coffee Shop in Woodmere, across the street from the LIRR station. It appears to have opened in the mid-1970s and the sign almost certainly dates from then. I have seven cards of Bill Brennan. This one is from 1989 Donruss. 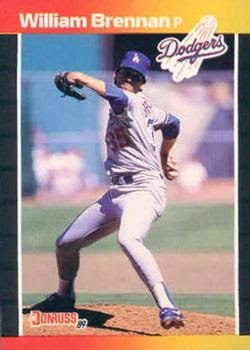 Playing career: Bill Brennan pitched in four games for the 1988 Dodgers and eight games for the 1993 Cubs. Overall he was 2-2 with a 5.18 ERA. Where he is now: A youth baseball instructor in Georgia. My memories: I remember his card standing out to me as he basically shared a name with the Chief Justice of the US Supreme Court. Google Autocomplete results: He is third when you type Bill Bre, between Bill Bredin, a youth hockey coach in New Jersey, and Bill Bresnan, a New Jersey man who has written a love letter to his wife every day for almost 40 years. Another prominent Bill Brennan was a boxer who twice fought Jack Dempsey. Coming up next: The next profile will be Tom Brennan. Recently I supplied Wes of Jaybarkerfan's Junk with some ammunition to bomb Bob Walk the Plank and P-Town Tom. In return he supplied me with a ton of minor league cards and 2015 Topps and Heritage cards. What color is Charlie Blackmon's beard? Looks like a light brown, maybe somewhat reddish. According to the back, however, it is "ebony". I think we can safely call this an error card. I know people are gushing about the new Topps set because of the borders, but it has the same lackluster photography as the last few years, and to me that's a lot more important than the border. Who has a picture of the pitcher in mid-delivery and can't fit the ball into the frame? He sent a lot of inserts too, like this one about Roger Maris spoiling Patriots Day for the Red Sox, which was cool since this box came in the mail on Patriots Day. There was also a bunch of Heritage in the box, where for Topps it is still 1966 and all the players in the cartoons are white. I got this nice patch card of Nick Castellanos, than later in the evening saw him in the Tigers-Yankees game on TV. Most of the box was filled with minor league cards from the late-90's and early 00's, such as Just 2K. Though minor league cards by then were more serious than the highly-goofy 80's cards, there were still some great wacky shots. There was even a black-bordered parallel card. This was hand-written in, #1/50. I don't think I've ever gotten the first card in a numbered series before - very cool. Childs' Restaurants were some of the earliest restaurant chains, alongside other NYC chains like Horn & Hardart and Bickford's. Started in 1889, the last restaurants in the chain closed in the 1960s. Childs' used a nautical them in their design, often intertwined seahorses such as those that remain at this location on 6th Avenue and 28th Street, now a McDonald's. I have two cards of Michael Brenly. This one is from 2011 Bowman Chrome Prospects. 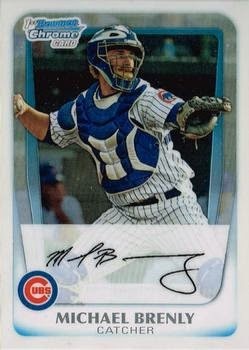 Playing career: Catcher Mike Brenly was the 36th-round draft pick in 2008 of the Chicago Cubs, for whom his father Bob was an announcer. Brenly languished in A-ball from 2008-2011. After a 2011 season in which he hit .206 with 1 HR and 24 RBI in 96 games, he was promoted to AA, where he hit .227 with 6 HR and 28 RBI. When his father moved to the Diamondbacks in 2013, so did the son, who played in only eight games at AAA Reno. Where he is now: He was finally affiliated with another organization from his father in 2014, playing for Boston’s AA team in Portland, hitting .168 with 2 HR and 18 RBI. He re-signed with Boston for 2015 and is 4 for 10 in his first three games at Portland. Google Autocomplete results: He is the only person to come up when you google Michael Brenl. There do not appear to be any other prominent Michael Brenlys. Coming up next: The next profile will be Bill Brennan. The interesting Corner sign here is not for the Corner Cafe, a typical Manhattan Deli. 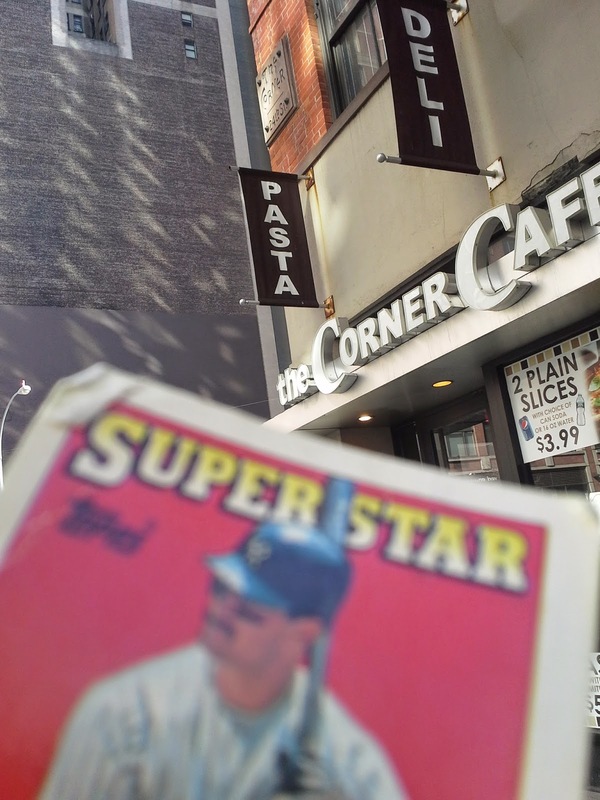 No, it is the little sign above it that reads "The Corner, 24th Street". By 1893 the saloon was closed due to police raids after it became widely known as a place for illicit affairs. The site has changed businesses many times in the 120+ years since but that Corner sign remains. I have 28 cards of Bob Brenly. This one is from 1988 Score. Playing career: Bob Brenly caught for the Giants from 1981 to 1989. In 871 games he hit .247 with 91 HR and 333 RBI. His career year came in 1984, when he hit .291 with 20 HR and 80 RBI, earning his only all-star appearance and MVP vote. Where he is now: After his retirement he was a Giants coach and later the manager of the Diamondbacks, winning the team’s only World Championship in 2001. After being fired in 2004 he became a Cubs broadcaster, and moved to the Diamondbacks’ booth in 2013. Interesting facts: His son Michael Brenly was drafted by Dad’s team, the Cubs, in the 36th round in 2008. When Dad moved to Arizona in 2013, so did Michael. In 2014 he moved to the Red Sox organization, his first time playing for an organization his father did not work for. My memories: $*#%! 2001 Diamondbacks. Google Autocomplete results: He is second when you type Bob Bre, between Bob Brennan, a businessman convicted of money laundering, and Bob Breunig, a former Cowboys linebacker. There do not appear to be any other prominent Bob Brenlys. Coming up next: The next profile will be Michael Brenly. 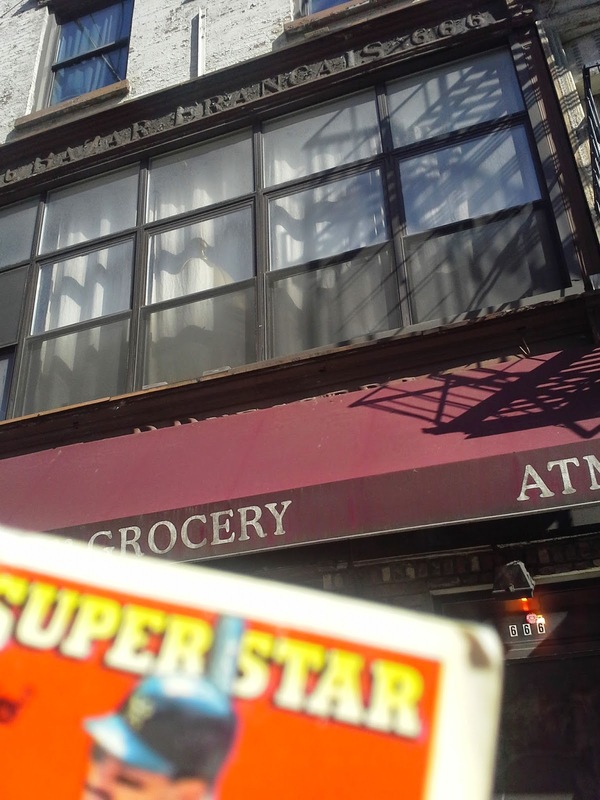 Two long-defunct businesses that dated back to the nineteenth century still have their signs up on Sixth Avenue between 20th and 21st Streets. 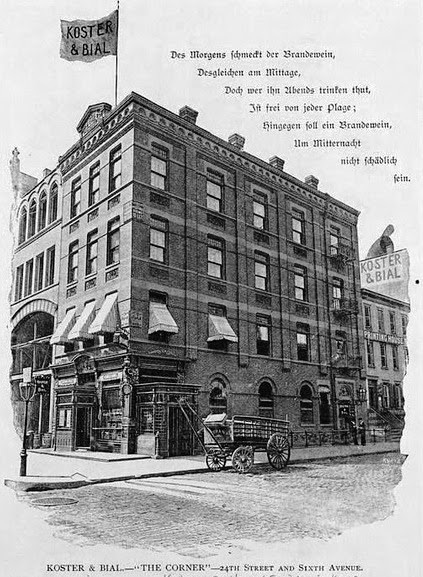 Bazar Francis, which opened in the 1890s, was America's first store to sell imported cookware. 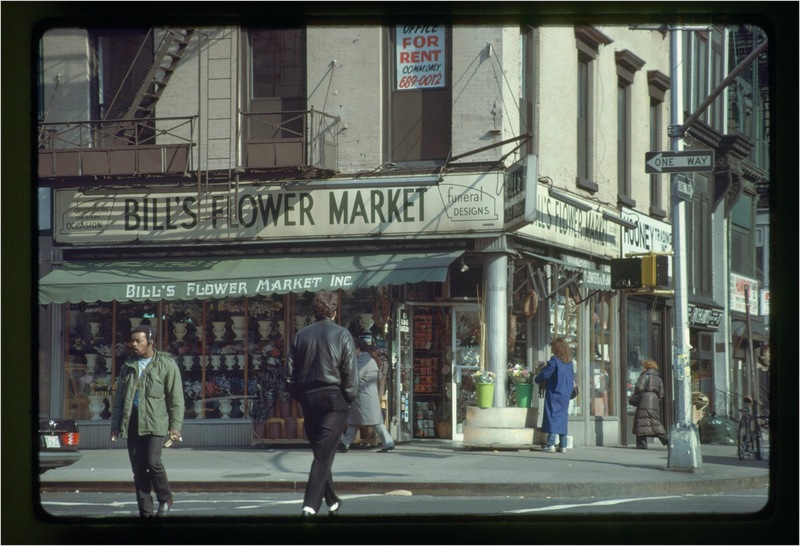 It was a predecessor to later stores like Crate & Barrel, who in fact got some of their merchandise for their first store from Bazar Francais.The store went out of business in 1975. M. Rowan Ice Cream Depot opened in the late 1860s, and was out of business by the 1930s. Very cool that a store that has been out of business for over eighty years still has it's sign up. I have eleven cards of Fred Breining. This one is from 1982 Topps. 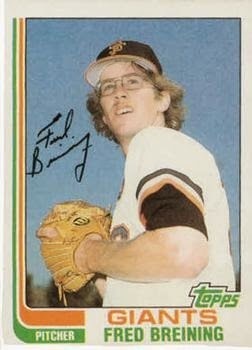 Playing career: Fred Breining pitched for the Giants from 1980 to 1983, going 27-20 with a 3.34 ERA. He was traded to Montreal after the 1983 season and reported to the Expos with a shoulder injury that the Giants claimed to be unaware of. Breining reinjured the shoulder four games into the 1984 season and never pitched in the majors again. 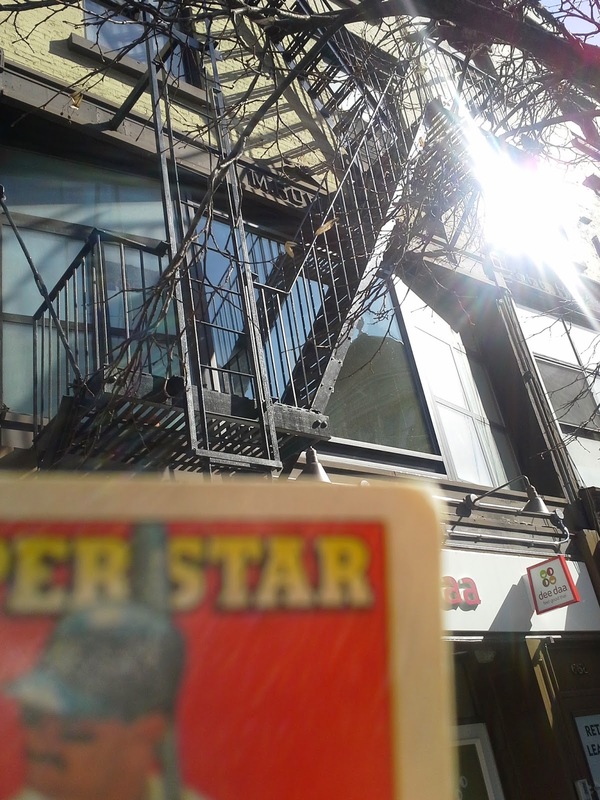 A fuller account of his career can be found at the 1982 Topps blog. Where he is now: He has been a prominent pitching instructor in the San Francisco area for many years. In 2005 he was awarded a patent for a motion training device. Google Autocomplete results: He is first when you type Fred Brei, ahead of Fred Breidt, a microbiologist at North Carolina State University. There do not appear to be any other prominent Fred Breinings. Coming up next: The next profile will be Bob Brenly. 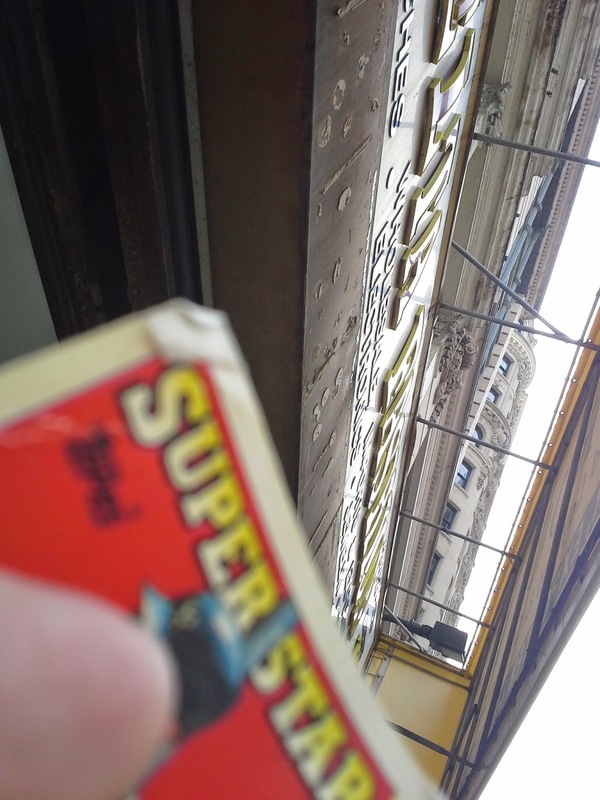 A fun thing to do for if you are a fan of old signs is to look under awnings. Sometimes the awning is placed over an older sign for a different business. 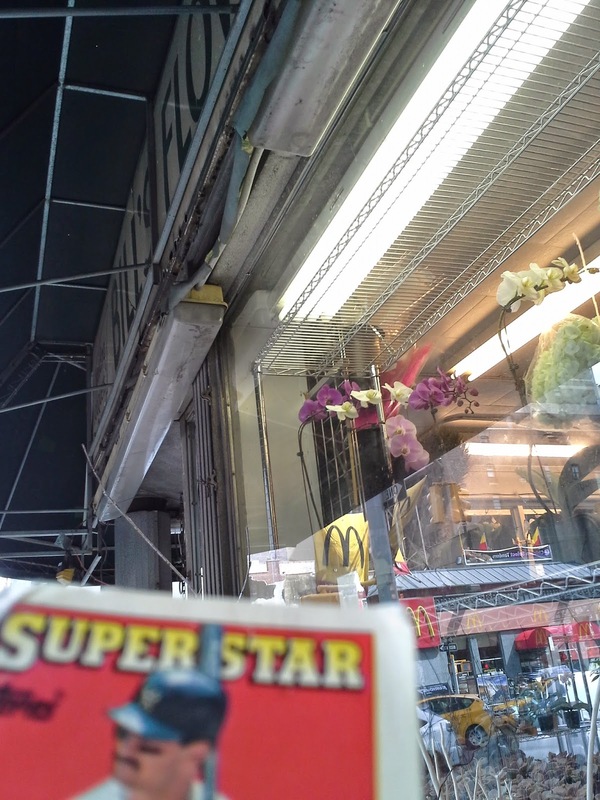 The Hello Deli is around the corner for the Ed Sullivan Theater and was often featured on the David Letterman show that was filmed there. 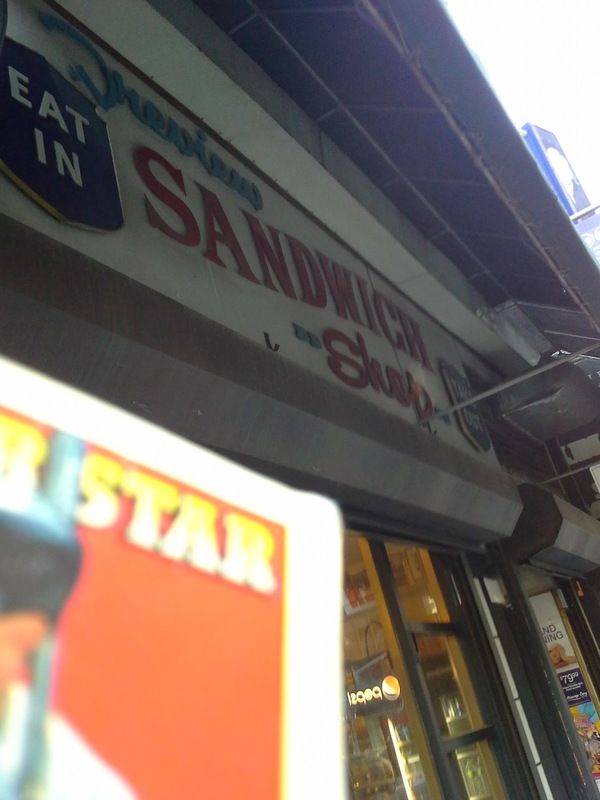 In one of their last episodes they pointed out that the sign for the previous tenant, Preview Sandwich Shop, which probably dates back to the 1960s. But the painted sign lives on underneath! ...used to be Delta Fashion. 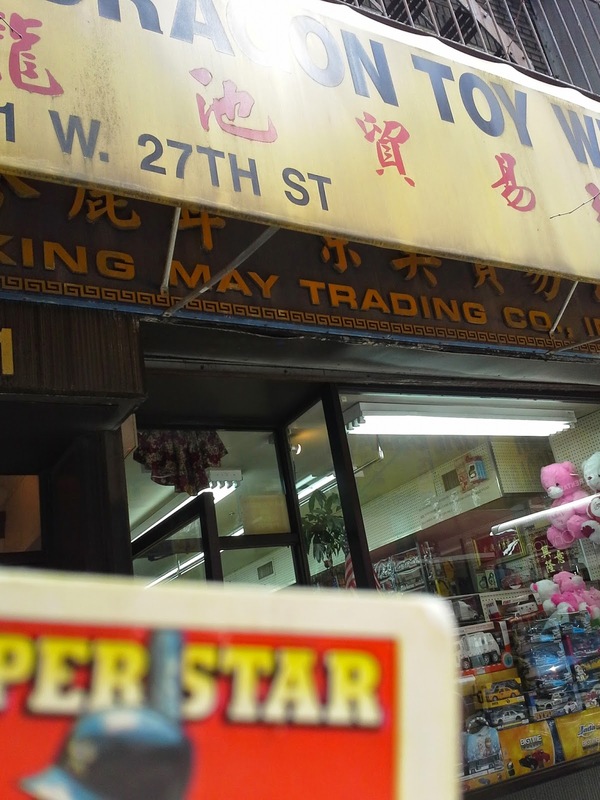 Finally, here is Dragon Toy Wholesales on West 27th Street, and the old sign for King May Trading. I have three cards of Brent Brede. This one is from 1999 Upper Deck. 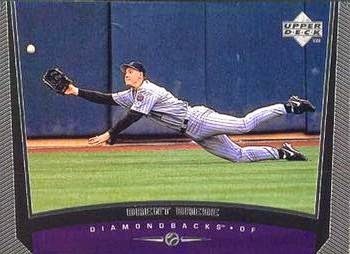 Playing career: Outfielder Brent Brede played in 169 games for the Twins and Diamondbacks from 1996 to 1998. In 169 games he hit .251 with 5 HR and 40 RBI. Where he is now: A seventh grade social studies teacher at Wesclin Middle School, and the Boys Basketball coach at Trenton High School, both in Wesclin, IL. My memories: I don’t remember much, but I do remember hearing that his name is pronounced "Brady". Google Autocomplete results: He is eighth when you type Brent Bre, between Brent Brennan Nebraska, Wide Receivers Coach at Oregon State, who did not follow that school’s head coach to the Cornhuskers, and Brent Brendan Sexton, referring to two actors from the TV show “The Killing”. There do not appear to be any other prominent Brent Bredes. Coming up next: The next profile will be Fred Breining. 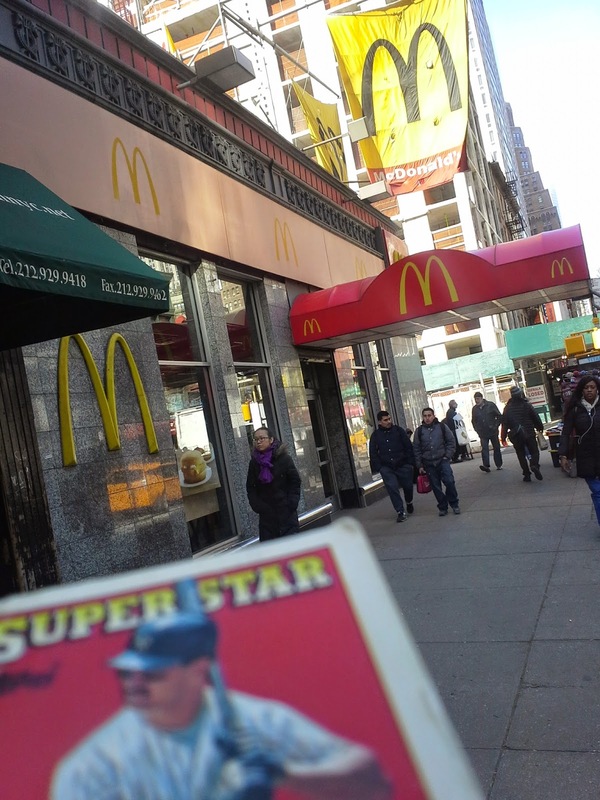 The rookie card from one of the biggest stars in baseball. Once upon a time that would be an instantly-recognizable card. 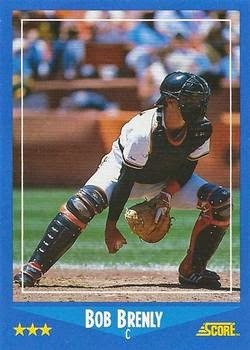 You could always easily picture in your mind the rookie card of Mattingly, Canseco, Gooden, etc, even if you didn't have the card. At least for me, I couldn't do the same for Kershaw, Cano, Verlander, et al. It's fun to get cards from an established power hitter from early in their career when their manager would still call on them to bunt instead of swing for the fences. This may be my favorite card from this package. Play-at-the-plate cards are a bit cliche in the blogosphere but this one has a more dynamic take.